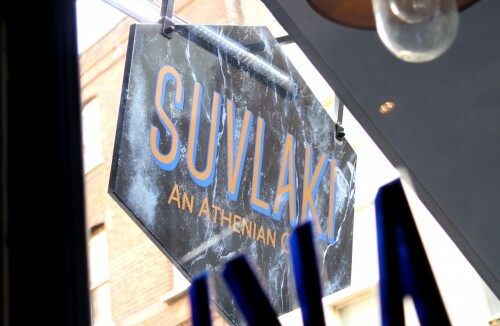 ‘Suvlaki’ refers to a grilled meat skewer eaten on its own or inside a wrap, and in theory should be as ubiquitous as burgers and hot dogs in the world of street food. 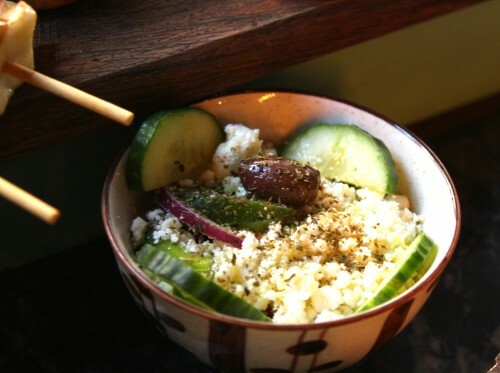 The menu consists of suvlaki of course, but also wraps and a variety of salads, as well as a baked feta dish, which I defy anyone to come away from and not salivate at the thought of for weeks to come. The restaurant itself is decorated in gorgeous shades of blue with graffiti inspired by that you’d find in Athens, giving it all a more authentic flavour. Not that I’ve been, but if it hadn’t been about -5 degrees outside I definitely could’ve imagined I was there. 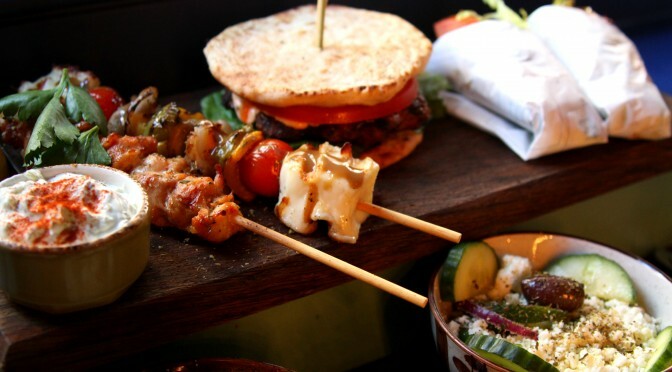 We went for the platter which was a sharing option of a variety of wraps, skewers and sides, and it went down a treat. 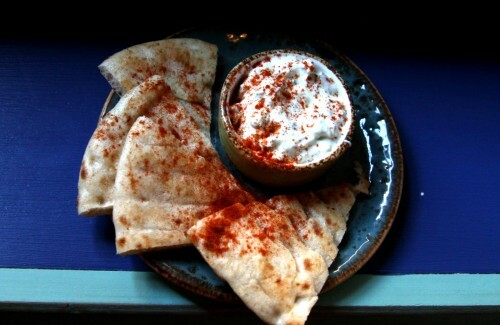 We started with pitta and tzatziki, which was chunky and incredibly garlicky, with warm, soft bread set off with a dusting of paprika. So far so good. 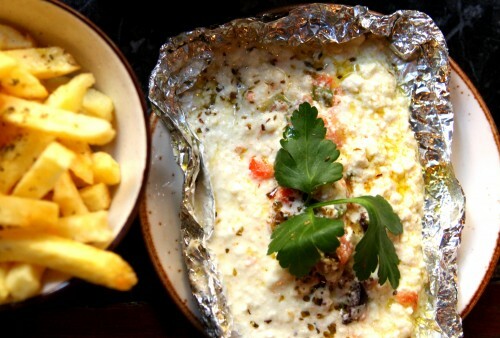 The platter was varied and generous, and everything was packed with flavour – the oregano that wafted from the baked feta as we unwrapped it was heaven. 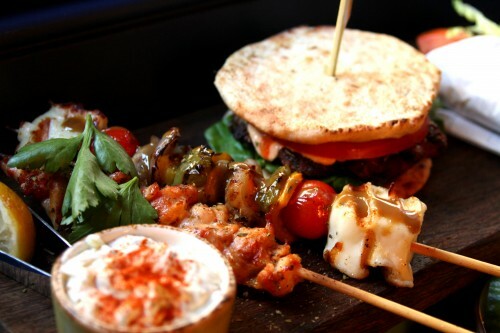 The chicken in the skewers and wraps was tender, and the mixed-meat burger was delicious, dunked in the tzatziki I could eaten it all again. THAT BREAD. 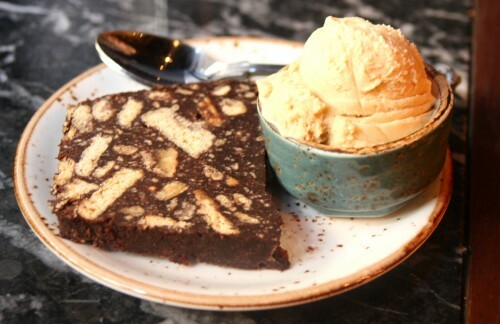 You must finish with the chocolate biscuit cake which is crunchy, very chocolatey and complimented beautifully by the homemade Greek coffee ice cream. It’s not super-cheap, with three skewers about £11 from what I remember, and wine from £22, but the flavours are fantastic, the staff are great and it’s a lovely little place to while away some time.